Maybe there is a particularly delightful rhyme, or intricate designs in the corner of a page. Maybe there are groups of words or pictures that would be fun to count. Or, maybe the storybook is part of a series where readers can notice patterns in a favorite character’s predictable behavior. To further develop ideas in using children’s books for math ideas, this article in the School Library Journal about adding STEM concepts to storytime could be helpful. It underscores some of the themes mentioned here, such as asking questions to help with prediction, or using time before and after the story to explore concepts. To get to the Pattern Game, open Todo Math, select free choice, and scroll down to Patterns under Mathematical Reasoning. Here children can notice the details of each object and its order, and predict the next object in the line up. Tune into our Back to School 2016 series on early learning success every week in August. Ready for more counting games? 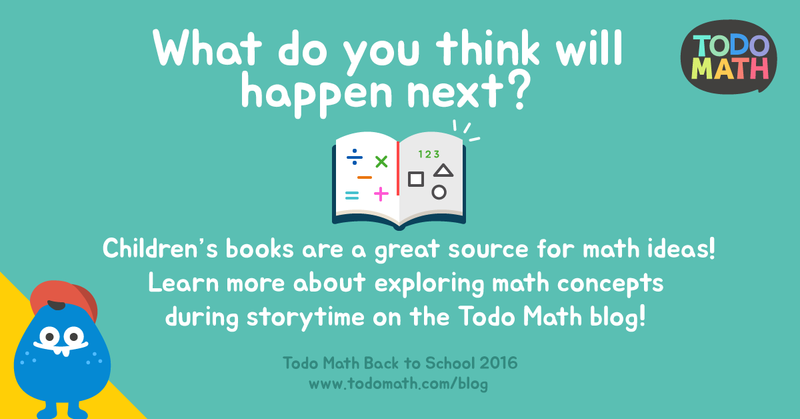 Don’t forget to download Todo Math for FREE on the iTunes and Android app stores!